Linda Wilson tells the story of how rural farmers and small business owners in Wasco County fought the corporate giants to win their own Wasco County Public Utility District. We are excited to announce the next workshop on our History from Below tour! 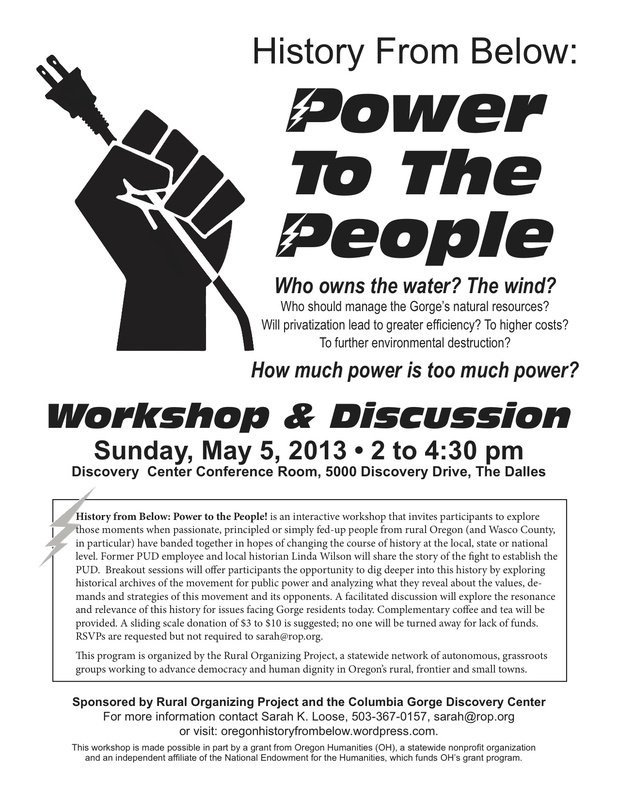 Power to the People will explore the movement for public power of the 1930s and 40s – and especially the decade-long struggle to establish the Northern Wasco PUD. Join us at the Columbia Gorge Discovery Center on May 5th in The Dalles! Download this great flyer for the workshop (thank you, Susan Buce!) and share widely! Click here for more details about the workshop. University of Oregon professor Daniel Pope offers an overview of social movements with a presence along Oregon’s North Coast as part of a broader narrative of conflict and consensus in American politics. Leroy Adolphson and Liisa Penner share stories and reflections on the North Coast’s vibrant community of Radical Finns from the early and mid-1900s in a panel facilitated by Sandy Polishuk. Singers from Astoria’s Pacific Unitarian Universalist Fellowship – the “PUUF Fab Five” – sing this song of the 99% of the 1890s at a workshop on local social movement history. 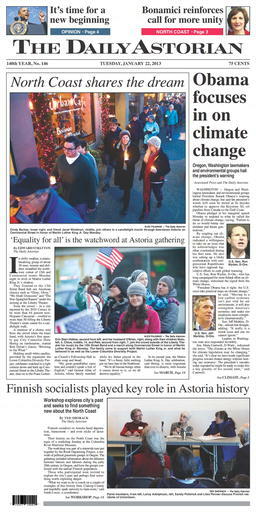 The Daily Astorian ran a front page feature article on our North Coast workshop in today’s paper. Here’s the flyer for our upcoming North Coast workshop. Please download, share and help us spread the word! 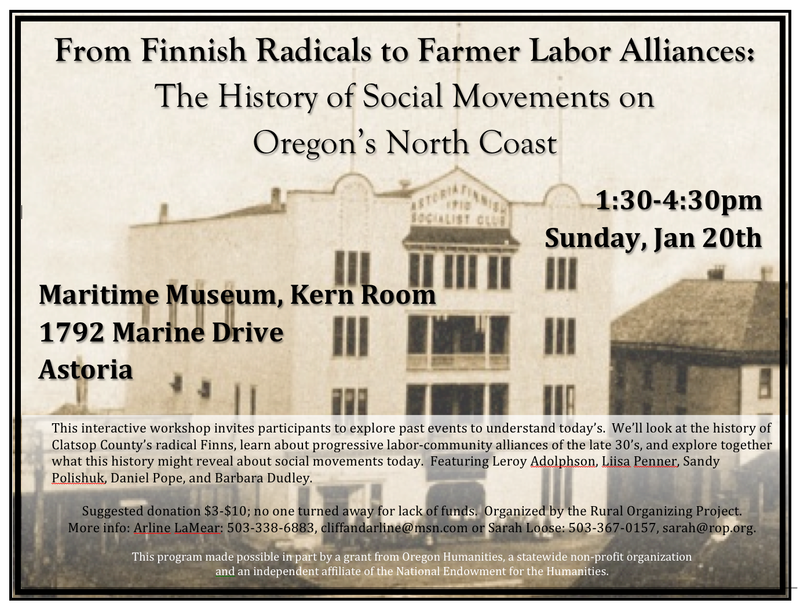 From Finnish Radicals to Farmer-Labor Alliances! History From Below comes to Oregon’s North Coast on January 20th with a special stop for Martin Luther King Jr. Day weekend! In this interactive workshop, participants will explore moments in the first half of the 20th century when passionate, principled or simply fed-up people from rural Oregon (and the North Coast, in particular) banded together in hopes of changing the course of history at local, state, and national levels. And we’ll look at the connections between grassroots movements past and present. There’s so much to explore: like the vibrant community of radical Finns in Svenson and Astoria that printed a popular socialist newspaper, founded successful cooperatives, and used theater and music to advance their socialist ideals. And in the late 1930s, Clatsop County progressives joined unions, socialists, and farmer organizations from across Oregon to push forward a broad progressive agenda through the Oregon Commonwealth Federation…. Find out more and Sign Up Today! At our Southern Oregon tour stop Dan Leahy (retired professor of political economy and social movements from The Evergreen State College) explored how history can inform the construction of social movements. Download his presentation notes here. Or watch the video of his talk. 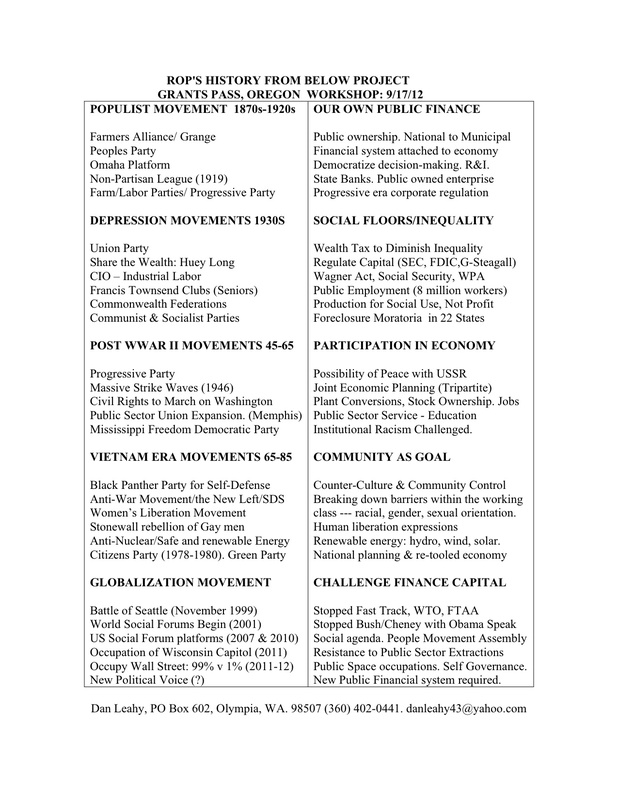 Then check out this nifty chart that Dan put together about the history of social movements in the United States. 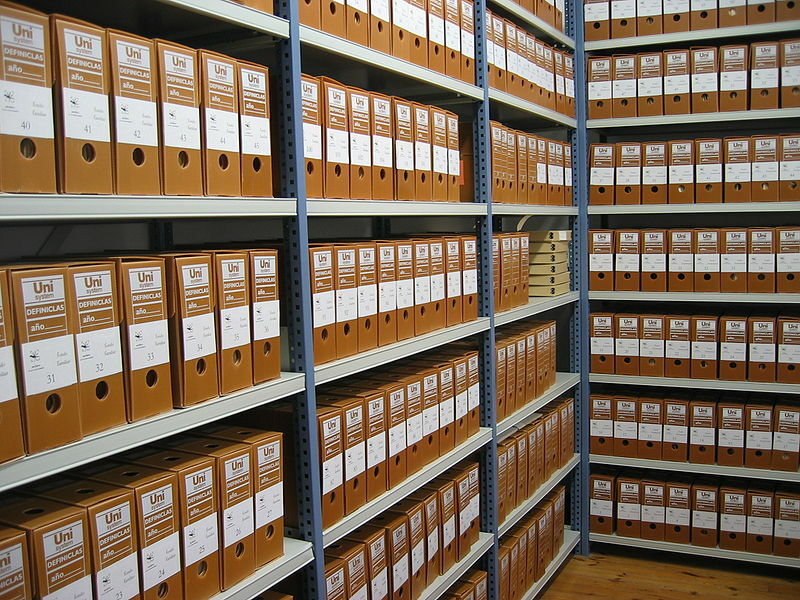 History from Below is made possible in part by a grant from Oregon Humanities (OH), a statewide nonproﬁt organization and an independent afﬁliate of the National Endowment for the Humanities, which funds OH’s grant program. Any views, findings, and conclusions, or recommendations expressed in this blog do not necessarily reflect the views of Oregon Humanities or the National Endowment for the Humanities.